Juniper came to the Medina Raptor Center in 2008 as a first year bird after it was suspected that she was exposed to herbicide. The exposure has compromised her vision in both eyes and has affected her immune system. Because of these injuries, she has gone on to become a wonderful educational ambassador to the Medina Raptor Center. 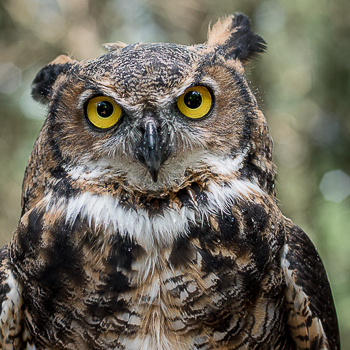 Found from the Arctic tundra to the tropical rainforest, from the desert to suburban backyards, the Great Horned Owl is one of the most widespread and common owls in North America. Prominent ear tufts widely spaced on head. Body brown and gray with dark barring. Orange facial disk outlined in black. Some forms pale gray to white. Sexes alike in plumage; female larger. Immature like adult. Fledges from nest while still downy around the head and without noticeable ear tufts. Broad diet of animals, from small mammals to rabbits, geese, and herons. Some birds, amphibians, reptiles, and invertebrates, but mostly mammals. Resident across North America from northern Alaska and Canada through Mexico to Nicaragua. Also in South America to Tierra del Fuego. Found in a wide variety of habitats, but prefers open and secondary-growth woodlands and agricultural areas. Also in boreal forest, desert, and suburban and urban areas. Hunts at night, mostly from perches next to open areas. Uses a variety of nest sites, including trees, cliffs, buildings, and the ground. Does not make its own nest. Typically takes over nests in trees made by other bird species. Often puts nest in hollows or broken-off snags in trees. Not endangered; populations robust. Individuals may be threats to endangered species. Call a deep hooting “hoo-h’HOO–hoo-hoo.” Young make a loud, raspy screech.